We have had the wonderful experience of having a tree across the street that is home to caterpillars! 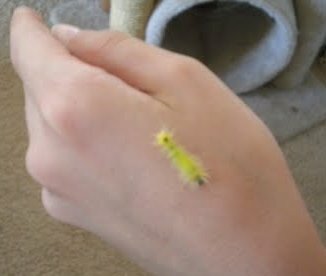 Of course, this means that caterpillars were caught and brought home to be shown. followed up with the inevitable question, "Can I keep it?!" And when you look into that sweet child's face, full of wonder and excitement.. well.. every mother knows how the rest of the story goes! The little caterpillar was first moved into a mason jar, but the lid sealed too tightly. It was quickly upgraded to a sprouting jar for it's temporary home. Of course a larger jar, full of leaves led to the introduction of more caterpillars into the environment. When we hit 15 caterpillars I knew I had to do something different..
Can you believe I went to the pet store for the caterpillars? I did. Okay.. not quite true.. I went to the pet store for ds8 when he said, "Mom, the reason I want to keep the caterpillars is to watch them and see how they live.. Maybe we can even watch them turn into butterflies to release!" How does one turn that down?! We now have a 5.5 gallon terrarium in our house. I know my little insect whisperer will find many insects to fill it over it's life.. What an exciting adventure! And it all started with a fuzzy little caterpillar being spotted on a leaf. I love life!